A few weekends ago, I spent two days in Brooklyn with two goals. First, I wanted to visited cemeteries to document gravestones and resting places of relatives, and second, I was hoping to visit the homes in which my ancestors lived. My first visit was to Green-Wood Cemetery, a location that is also a national historic landmark. The grounds, while partially under construction, were quite beautiful. I may return to take the trolley tour of the location, and now that I know at least one additional relative is resting there, I have a strong reason to return. 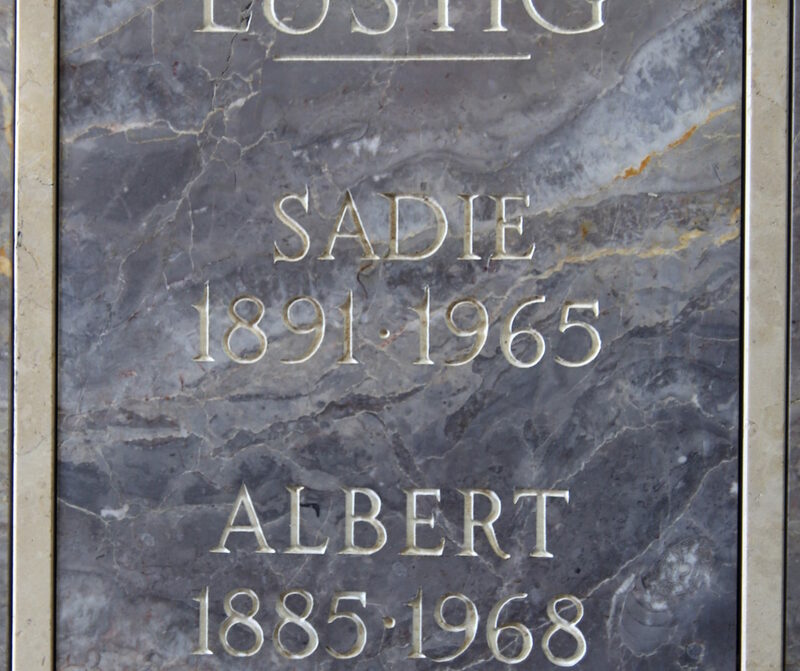 I visited Albert Lustig and Sadie Jacobs Lustig at Green-Wood. 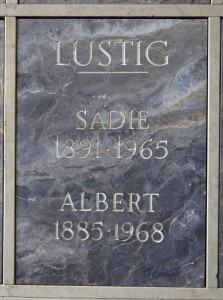 Albert is the brother of my great grandmother, Sadie Lustig Landes. This visit introduced me to the term columbiarium. 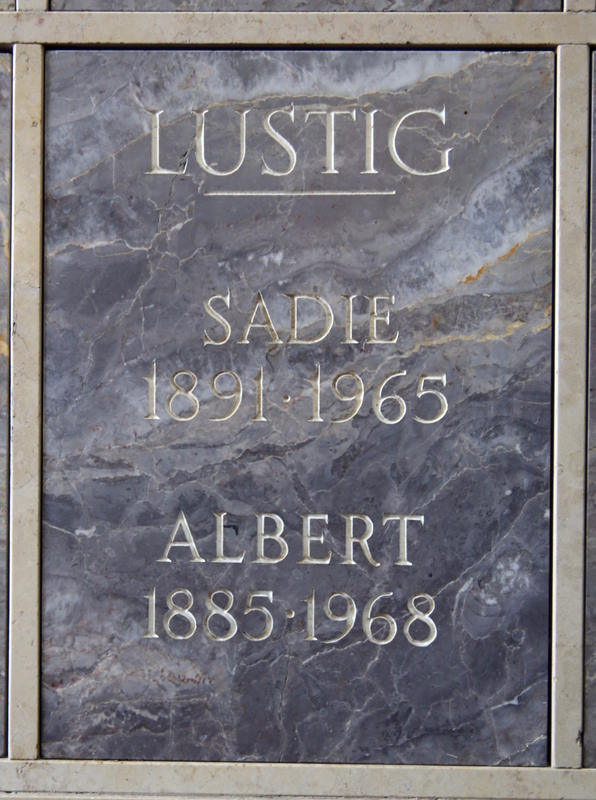 The columbarium was busy with a group of mourners, so I was careful to be very respectful of others while looking for the Lustigs’ spot. I am not familiar with the different neighborhoods of Brooklyn, and relied on GPS to find my way. I was able to visit a few old houses to snap photographs of the their exteriors before heading out of Brooklyn. The next day featured a trip back to Brooklyn, Queens, and Long Island. There were many sites to visit, so I used a Google document to keep the day organized. The document has also helped me remember after the fact where I had been, which is important if I plan to write about these trips on this site. The first stop was Mount Hebron in Flushing to visit Samuel W. Berman, my great grandfather, and his mother, Feige Short Berman. Finding these graves took a good deal of time, even with directions from the cemetery’s office. My girlfriend, who went on these trips with me, didn’t have a great feeling about visiting this cemetery. I’m not superstitious in any way, but once we found the stones, the bad feeling made sense. What we suspected to be Feige’s headstone had fallen. After documenting Samuel’s grave, we returned to the office to let someone know about the problem. They informed me they would have someone look at the plot, determine if the stone did belong to Feige, and send me a bill to fix it. I received the bill today. I’ll be looking forward to visiting again once the stone is reset and repointed. After Mount Hebron, I visited my great grandmother Pearl Kerstman Rosenberg at Mount Judah. Pearl’s story has become more interesting lately. Pearl’s first husband was Shlomo Kerstman according to family history recorded by Jon Derow, mentioned in the linked article. Her maiden name is documented as Libowitz on her son Isadore’s marriage certificate, but it is recorded as Hoffman on her own death certificate, informed by her daughter Lillian. In my family tree online, I listed her birth name as Libowitz. This has attracted the attention of someone who is a potential cousin as identified through AncestryDNA. His ancestors include Leibowitz, and he believes that the Pearl Libowitz in my tree is the Pearl Leibowitz recorded in his own family tree, someone for whom all records seem to be missing. This potential cousin also happens to have been a neighbor to my family twenty-five years ago. The coincidence is a little difficult to believe. According to the information I have, Pearl was born in or came from Odessa, while her son, Isadore, was born in Poltava. This doesn’t match with the Leibowitz history according to my potential cousin, but it doesn’t rule out the possible relationship either. I’m now looking for additional documentation, but I haven’t had much luck finding anything prior to immigration. Isadore’s naturalization records might provide some clues, but these need to be ordered directly from the Kings County Clerk’s office and could take much longer to receive, particularly in the aftermath of Hurricane Sandy. After visiting Pearl, I spent more time in Brooklyn looking for old residences. Many buildings from the early twentieth century are gone, replaced with retail establishments or different buildings. In some cases, the addresses no longer exist. Moving forward in time, my family moved to different areas of Brooklyn, and these areas continue to be residential. I’ve included photography in the family tree. The day ran long, and I didn’t make it to all the sites I had planned, but this fall I intend to return and continue my visits. A few days later, I noticed something I didn’t see in person. Samuel Berman’s headstone includes a Freemasons symbol at the top: the square and compass with the letter “G.” I didn’t expect any of my relatives to be Freemasons, but it does give me the opportunity to reach out to another organization that would potentially have records pertaining to my relatives. I seem to remember seeing the Freemason’s symbol as a very young child, somewhere as related to our family. I think it would be unusual for a Jewish person, especially in the 1800s to belong to this organization, wherein lies even more interest by myself!! By all means let me know if you find out more. Next PostNext Can you identify these photographs?